Signed l.r., red paint "Gaston La Touche". Not dated. Penleigh Boyd, European art exhibition for Australia (exh cat), Town Hall, Sydney / Athenaeum Hall, Melbourne , Sydney, 1923, p , no 490. Gaston La Touche, a painter of Belle Époque dreams , Woodbridge, 2009, pp 115, 189, 204, col illus p 118, pl 96. Salon and Académie: the charm of tradition: a catalogue of nineteenth-century European salon works , Sydney, 1984, pp , , illus p . No catalogue numbers. National Art Gallery of New South Wales: exhibition of continental art , Sydney, 1940, np, no 8. 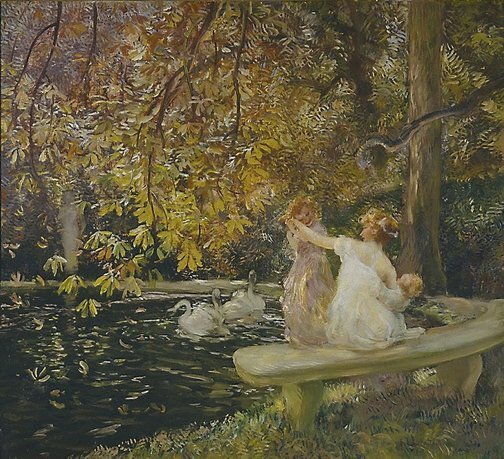 Gaston La Touche (1854-1913), les fantaisies d'un peintre de la Belle Époque , 2014, p 69. National Art Gallery of New South Wales (annual report of the trustees for the year 1923) , Sydney, 1924, p 2. 'Art Gallery Trust [letter]', Sydney Morning Herald, no 26690 , 21 Jul 1923, p 16. 'European art – exhibition at Town Hall – opened by Lord Forster', Sydney Morning Herald, no 26680 , 10 Jul 1923, p 6. National Art Gallery of NSW: illustrated catalogue , Sydney, 1924, p 54, no 140.